It’s not your typical Christmas story, that’s for sure. Shadrach, Meshach and Abednego had refused to worship the idol constructed by Nebuchadnezzar for his own self-aggrandizement. They proclaimed that they would only worship the true God of heaven, and thus found themselves on the wrong side of both the royal law and the furnace door. Nearly 500 years before Jesus was born in Israel, these three worshipers of Jesus’ Father were ordered executed in Babylon simply because they wouldn’t worship like the Chaldeans. It’s foreign to us now, but emperor worship was common in the Ancient Near East. Leaders of empires presented themselves as gods and the people worshiped them as such. Idol worship was accepted, and the concept of an invisible, omnipotent God would have been considered absurd. In contrast with that world-view, Shadrach, Meshach and Abednego were Jews. They were believers in the God of Israel, even while Israel was in exile. They placed their faith in a God who spoke the world into existence, not a God made by the metalworkers of the world. They worshiped a God who was unseen and the maker of mankind, not a God who was a king of an earthly empire. In short, this was the ultimate culture clash, and the three faithful Jews refused to bend or break. From Nebuchadnezzar’s perspective, they were stubborn. But one emperor’s concept of stubbornness is a worshiper’s understanding of faithfulness. They knew they were in the right, that idol worship was wrong, and that the God who made heaven and earth was not a statute, nor was a he a man. 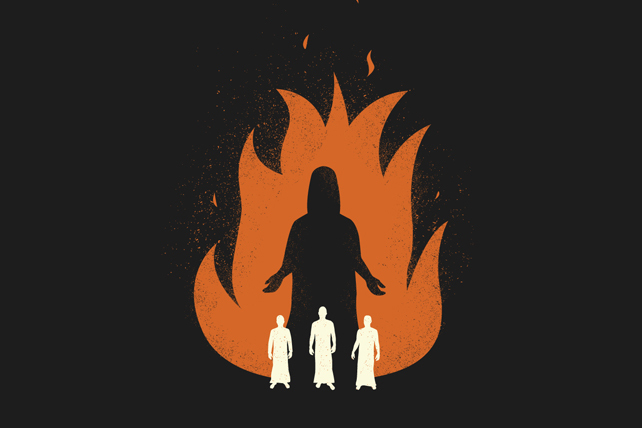 Despite worshiping an invisible God, Shadrach, Meshach and Abednego knew their Lord had the power to save. After all, he had saved before—back when Noah was on the earth, God helped Noah build an ark to survive the flood. He had helped Moses save the Israelites from Egypt by parting the Red Sea. He had saved Israel time and time again through the judges, and later through the kings. Yet this was different. These three men were not patriarchs, and they weren’t in Israel any more. Would Yahweh really be able to save them from fire in far-flung Babylon? God had never promised to save them, and so they were willing to be martyrs. They understood that death by fire is better than worship through idols. Yet they still had hope. Their hope was not limited to their physical salvation, but instead was yoked to the nature of God. God, they knew, was a savior. Their faith was placed in this absolute truth, and they waited to see what their Savior-God would do as their hands, which earlier refused to worship idols, were bound. As their bodies were hurled into the fire, no doubt their hearts looked heavenward, longing and pleading for God to save. And save He did. God not only protected Shadrach, Meshach and Abednego from the flames, but modeled for them how he would bring the news about God from isolated Israel to the gates of the world. Yahweh showed that if his saving arm could stretch into a Babylonian fire, it could reach round the world. But Shadrach, Meshach and Abednego learned more about God than simply his power to save. They learned what I like to call a Christmas promise: that when God comes to save his people from the fiery punishment that they deserve, he will not simply and providentially extinguish the fire. He will not merely and sovereignly foil the king’s plan. Instead, God will save his people by showing up himself. That’s exactly what happened here. God supernaturally protected the three would-be martyrs, but he did more than that. He entered the fire with them. He came to earth in a physical and visible way to protect His servants. The invisible became visible, and the transcendent became immediate. But the lesson was given nevertheless. When God wants to save his people from the fires of judgment, he will do so Himself. He will not share His glory with another (Isaiah 48:11). And when He does so Himself, He will come in a visible, meaningful way. He will come into the furnace of life, into the fires of this world, and He will be seen. He will stand out. He will be the one who looks and acts like the very Son of God. It was 500 years form Babylon to Bethlehem. Yet all those centuries later, the same God who came to rescue his worshipers before would do it again. This time he would not just be like the son of God, but he would actually be the Son of Man. The details would change, his glory would be exposed more clearly, but the mission would remain the same. The Christmas rescue mission would be carried out by a God who would do it himself. He is the only one that can save us, and he does so by coming to earth, physically and visibly; The Son of God and the Son of Man. Jesse is the Teaching Pastor at Immanuel Bible Church in Springfield, VA.